Can you design a nursery around an outfit? I was at Janie and Jack the other day looking for a baby shower gift for a sorority sister. They were having a huge sale, and I just happened to see this London dress (hugely discounted). I cannot possibly overstate my excitement about this outfit, which of course had to have a pink cardigan to go with it. It was the only one left, and it was 6-12 months. This will either be H’s outfit for Morgan’s wedding in England in August (she’ll be 5 months and might just fit) or it will be her Christmas card photo dress. I am completely smitten with this whole little girl business. Anyway, this is also EXACTLY what I’ve been picturing for months in my head for her nursery. 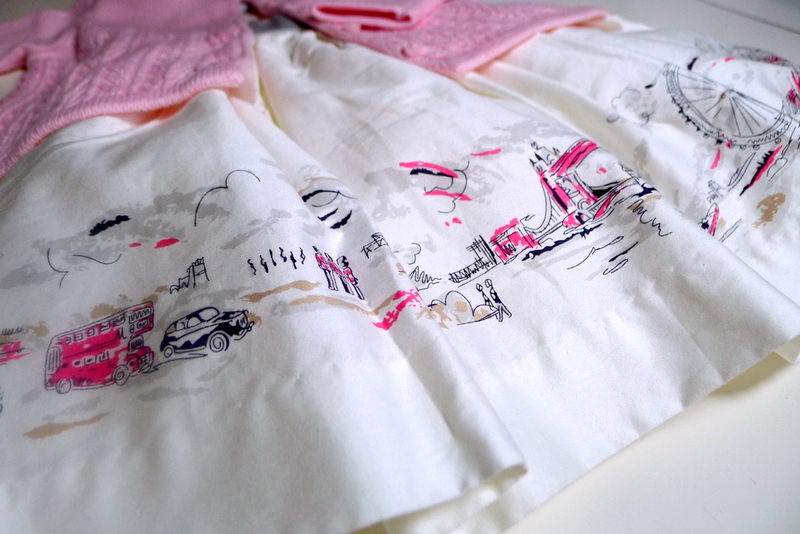 Whites and neutrals with shots of hot pink and lots of Englishness. I must do some nursery plotting. Incidentally, I also kind of love this dress, which I bought for my sorority sister’s soon-to-arrive baby girl.